I started with a base of Night of Navy and distressed a sheet of So Saffron patterned paper from the Windsor Knot set. 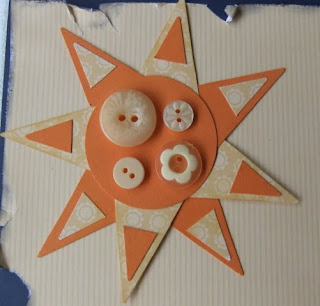 I made a sun embellishment using my large star punch for the rays and the 1 3/4" circle for the centre. The buttons come from the Button Latte set. 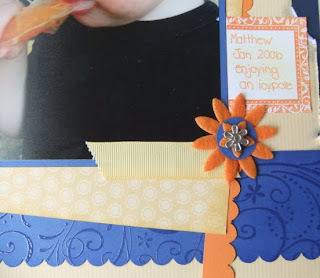 I used some felt flowers and a silver flower Designer Brad for another embellishment. 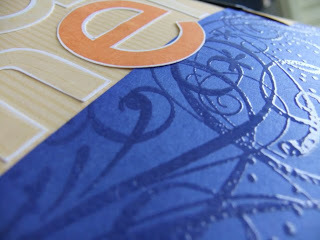 I used the So Swirly wheel on a strip of Brilliant Blue cardstock and clear embossed. It has a nice texture irl. 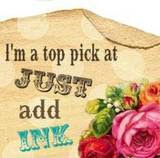 Happy scramping (thats stamping and scrapbooking lol). Oh my goodness. That photo is PERFECT for this color combo! 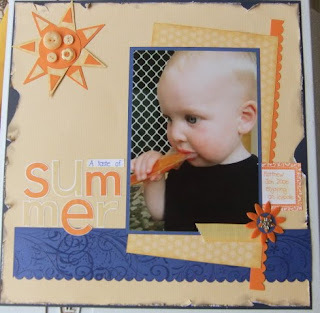 Love your sun, your LO and the photo! This is an amazing LO. Everything works together so well. The subject is absolutely precious! It is beautiful! I LOVE the clear embossing - so pretty! Absolutely lovely Lisa. I love it. Great LO! Love that pic! Thanks for joining us at SPCC this week! Great layout! THat photo is adorable! SUCH a beautiful layout. 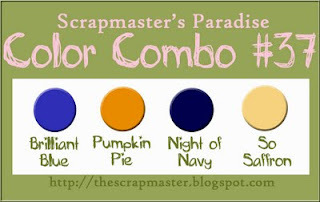 The colours are perfect, and I love your embellishments.